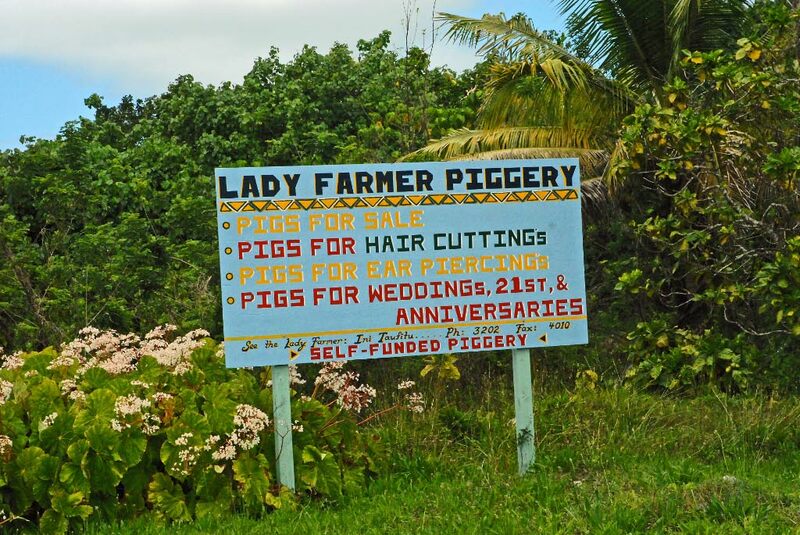 We posted a photo of a billboard for a Piggery on Niue on the Baba Cam a few days ago. When we first saw it I was perplexed why a pig would be present for a haircut. Teresa cut my hair on the boat while we were there, no pig was necessary. I then realized all items were special occasions. On Niue an ear piercing is a ‘coming of age’ event for young girls. So all items listed are special events for which a pig is offered. Since the first item is a pig for sale I wonder if the follow on items are something different? Pigs for entertainment? A dancing pig? A pig circus? Having never been to a hair cutting or ear piercing we really can’t be sure, but I suspect all listed events bode poorly for the pig involved.